Native to Mexico, dahlias prefer warm weather and do not tolerate frost. Grown for their wide variety of blooms that range in color from white to deep crimson, dahlia flowers can be found in nearly any color other than blue. 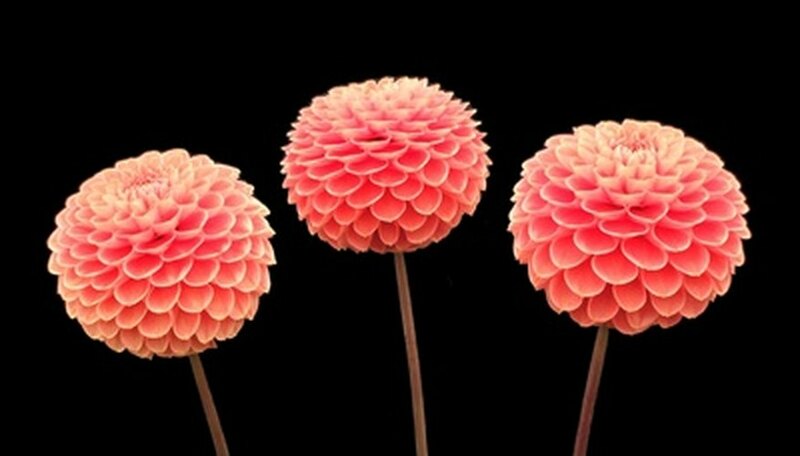 Bloom size varies from tiny 1/4 inch pom pom varieties to giant dinner plate dahlias with a diameter of 12 inches or more. Growing to a height of 3 to 4 feet, dahlias do require the support of plant stakes or a fence to maintain their lush foliage and prevent stem breakage. Grown in containers, dahlias make excellent specimen plants with their showy blooms. Select a container with a diameter of 12 to 14 inches and depth of 12 inches or more. Containers with flat bottoms provide better support than tapered pots for these massive plants. Check that the container has adequate drainage holes, as dahlias suffer from wet soil. Drill holes to increase drainage, if necessary. Combine equal parts peat moss, perlite and potting soil to create a lightweight soil mixture. Mix in a large bucket or bowl and moisten with water to dampen the mixture. Peat moss is difficult to work with when dry. Fill the container 1/3 full with potting mixture and place the dahlia tuber horizontally on the soil. Cover with an inch or 2 of soil and water to moisten the soil. Watch for sprouts to appear in seven to 10 days, depending on the cultivar and the weather conditions. Once leaves form, cover the stems with potting soil, leaving just the top leaves visible. Continue to add soil every few days as the plants grow until the soil is 2 inches below the rim of the pot. Keep soil moist. Place in a sunny location that receives at least five hours of sun a day. Dahlias prefer full sun and thrive in eight or more hours of direct sunlight a day. Stake the plant with a 4-foot bamboo plant stake or metal rod by inserting the rod into the pot and pushing it to the bottom. Tie the main stem to the stake with plant ties once it reaches a height of 12 inches and repeat at 12-inch intervals as it grows. Pinch out center leaves on the main stem when the plant is 4 to 5 inches tall to force new growth long the main stem. This creates dense compact foliage and prevents stems from growing tall and spindly. Disbud when buds begin to form. Buds form in groups of threes. Removing the two side buds and allowing the center bud to grow produces large showy blooms. Fertilize with low nitrogen fertilizer once a month until August. Water when soil dries. Check the soil often as plants grown in contains dry quickly and may require daily watering.